You need everyone in your organization to perform at peak levels, and many are surprised to find out the percentage of workers who need basic job skills training. Despite all our efforts, basic skills deficiencies persist among all age groups, which means this is probably affecting your own organization as well. Even mentioning basic skills training, however, is likely to clear a room. Why? Because for the most part it’s perceived as incredibly boring. But what if you could make even basic skills training fun? That’s exactly what gamification is all about. Explaining to people how important basic skills are, whether to their own career development or the overall success of the organization, simply doesn’t help because it doesn’t change the fact that most basic skills training is about as exciting as watching paint dry. That’s precisely the point at which gamification can play a critical role. But does it really work? Startup incubator and seed fund 1776 seems to think it can. The company’s Challenge Cup is a global startup competition that takes place in multiple cities around the world to identify the most promising startups solving the biggest challenges in four categories – education, energy, health and cities. The most recent winner from the New York City event in the education category was Cognotion, a company that identifies talent, delivers functional utilization of knowledge, and decreases employee turnover rates using gamification and video tools designed for entry-level millennials. It leverages emotion and context to teach hard and soft skills to entry-level employees. Co-founders Jonathan Dariyanani and Joanna Schneier say the proof is in the proverbial pudding: “We find that when we present the same industry-specific, job-specific information that’s contained in a training manual to somebody in the form of a game or with a mentor, it increases absorption, comprehension and retention.” Launched in 2013, Cognotion is currently selling its gamified training solutions at the rate of $1 million per month. Clearly, it’s working. Reward Progress. You’ve probably played games at some point that allow you to unlock various rewards as you make progress. Incentivizing progress is one of the most basic gamification principles to incorporate in your efforts. Competition. People love it when there’s an element of competition built into an activity that would otherwise be ho-hum. In gamifying basic skills training, this will involve building in the capability for people to see how their progress compares to that of their peers, and again rewarding those at the top of the heap. Avatars. Many games allow players to assume some kind of character identity. Incorporating customizable avatars into your basic skills training allows for a level of self-expression that is often lacking in the workplace. For additional information on gamification in the eLearning environment, see our free white paper on Gamification for Effective eLearning, and be sure to avoid the most common Gamification Mistakes. You might also want to read the very first book ever written about gamification in the workplace from 1984, The Game of Work by Charles Coonradt. 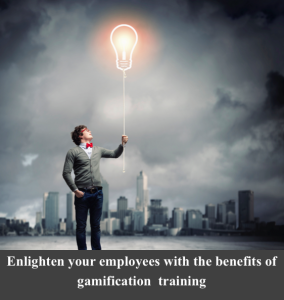 Gamification is a trend in 21st century organizations that you cannot afford to ignore.